Ok, I know I think differently about things than other people. Some people would do anything to avoid a road trip. I would much rather drive than fly (though I don’t mind flying). And when you arrive at a city, I think many people like to take the bypass to avoid central city traffic. If it’s in the middle of the day (translation – non rush hour), I like to stay on the business route and go through the downtown. Not only is it quicker – the city center route is more interesting. Each city has it’s own personality, it’s own sky-scape, it’s own arrangement of rectangles, squares and sometimes triangles. I am fascinated by the buildings. However, because I am usually on a four lane (or more) highway with a lot of traffic, pictures never turn out very clearly. 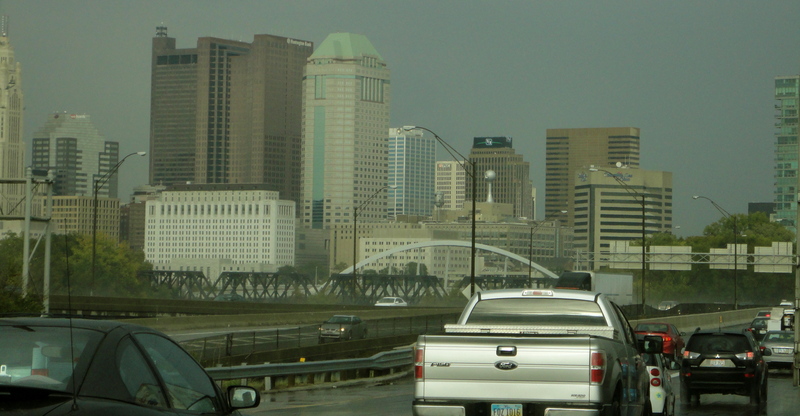 Here is Columbus, capital of Ohio.